Many blog readers will remember all the work done in Green Lane a few years ago to turn the back green into a temporary flood plain to alleviate flooding in Caverleigh Way, Green Lane and other nearby areas. In total £1,709,000 was spent on the scheme of which £150,000 was contributed by the LB of Sutton. 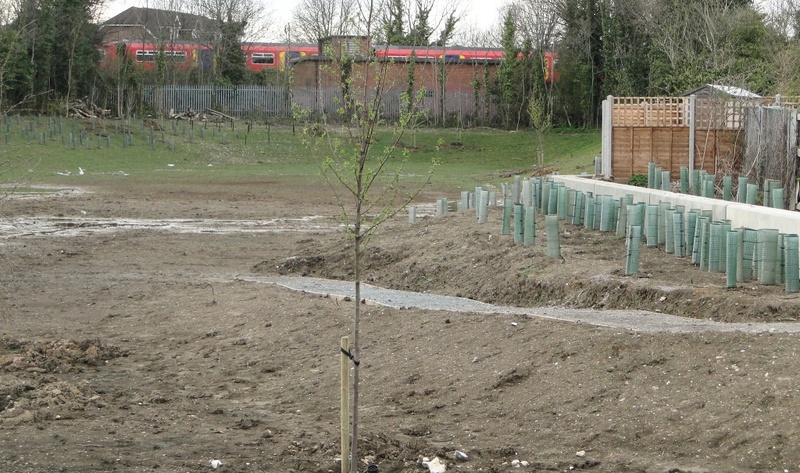 These photos on the right, showing some of the early stages of planting were taken in March 2013. Since then unfortunately, a number of people have contacted me to complain that in certain areas, the flooding is now worse than what it was before the scheme came into existence. 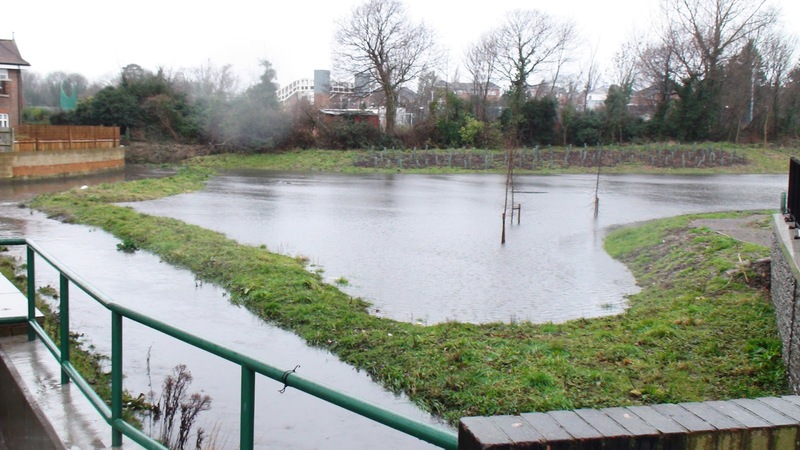 As you can see above, when the Beverley Brook bursts it's banks, it does indeed fill the newly created flood plain instead of the cricket club and the properties in Green Lane and at the low numbers in Caverleigh Way which back onto the water way as it used to be. However in solving this problem it seems a different problem has been caused. 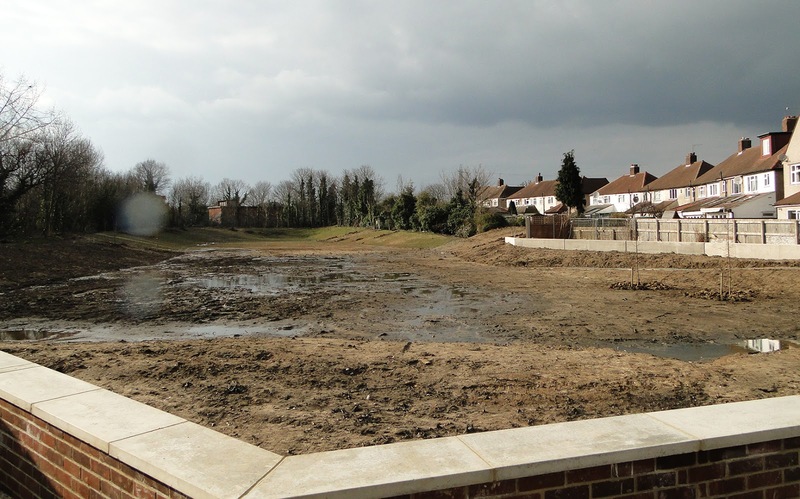 Readers in the area will be aware that the green space between the properties in Caverleigh Way and the Beverley Brook was used to dump an amount of earth that was taken from the Back Green in order to lower it and create the flood plain. "Having gone through the turmoil last year, when thousands were spent to protect the cricket club. The building of the run off area and the building of the Green Lane Dyke, that is on the Caverleigh Way side of the Brook. 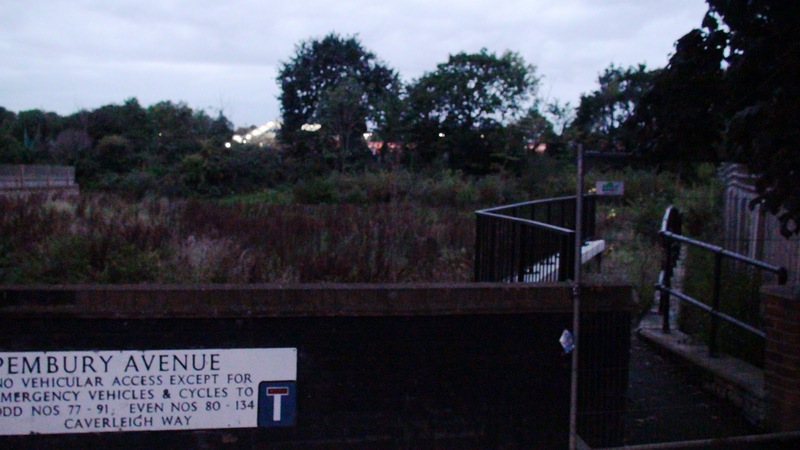 Since it has been built the council have been called out many times due to the flooding it has caused on the wrong side of the Brook. I was informed that a trench had been dug and a perforated pipe had been laid and topped with gravel then soil. This would allow any collecting water to drain into the Brook. But guess what? 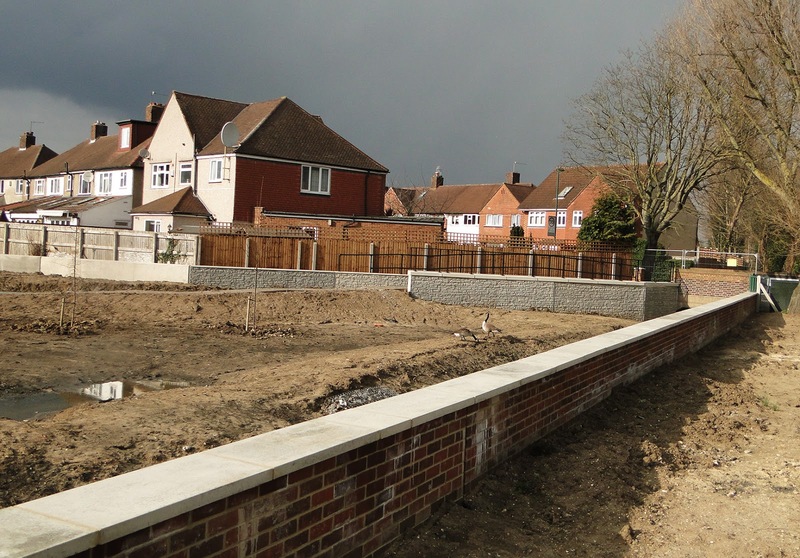 It did not work - with the skip lorries and vans driving over the area it has compacted the soil down." Paul kindly included some photos including these two on the right here. One showing the flooding behind the garages and a more serious one showing flooding in a back garden. This is only one of several complaints I have received from people who have told me about flooding in their back gardens. This seems to now be concentrated at the high number end of Caverleigh Way. Paul also told me that he and also neighbours of his had contacted the council numerous times. He said the council had acknowledged the problem but that they had heard nothing more about it. What Has Changed On The Green? It seems to me that what has happened is that a ridge was created in the green space here and the water which would previously have flowed across the green and down into the brook can no longer do so. Instead it is forming pools of water that flood the garages and back gardens in Caverleigh Way. I spoke to one local chap last year who said he thought someone had tried to save money by dumping the soil on the green here instead of paying for it to go somewhere more appropriate. I can't speculate on this myself but perhaps an investigation is warranted necessary to find out why flooding is still a problem here after nearly two million pounds of public money was spent specifically to fix the issue. While on the subject of the flood plain. The 'temporary' fence blocking the pathway down into the area had a sign on it for a while saying it would be open to the public within months. This sign disappeared a great many months ago and there has yet been no sign of the path being opened to the public.